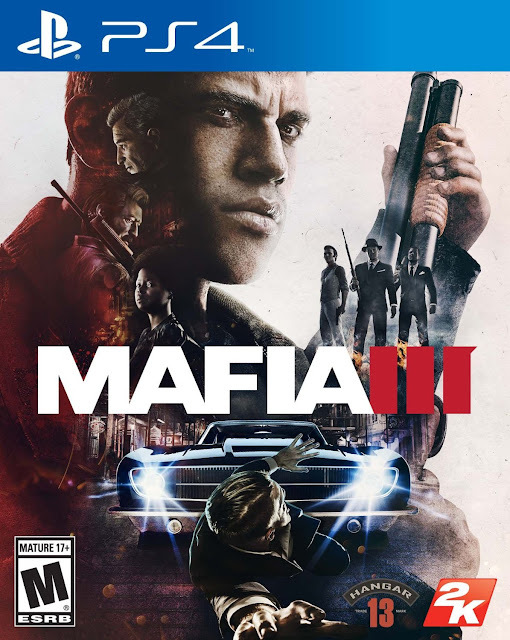 Chrichton's World: Review Mafia III (PS4): An improvement on Mafia II although still plagued with some flaws! Review Mafia III (PS4): An improvement on Mafia II although still plagued with some flaws! Mafia II was hyped up to be one of the best games ever. And sure the demo made me look forward to playing the game. But soon certain flaws became real apparent. The open world for example was completely pointless. All you got to do was collect some items and then drive from A to B. No side missions or anything else to make it worth your while. To top it off the story was a rehash of any gangster flick made in the world. If you have seen enough of them not a single thing in Mafia II will impress you. Well, Mafia III is not perfect but at least has made an attempt to flesh out the game by giving you more to do. Next to the main missions you have side missions consisting of loyalty missions and optional missions that will increase your kickback. There also are race missions but I never bothered with those. I recommend doing enough of these optional missions because they help you upgrade your weapons and items. One problem however is that these fetch missions are very repetitive. And more often than not you basically are replaying the same mission over and over again. I wished they had given us more variety. Still the fact that you do have some freedom to accomplish these missions the way you want makes the repetition acceptable. I was very happy with the introduction of stealth in this game since it sure made the game a whole lot interesting. You even get the option to unlock and buy silenced guns. Too bad though that they do less damage and that you can't buy silenced sniper rifles. Would have made it even more fun. While it wasn't a big issue for me I do think they should have given you the option to finish and play the loyalty missions after you have unlocked them whenever you feel like it. This isn't possible due to a restriction. You are required to assign a district to a character of choice in order to play two of the loyalty missions. When you are given the option to assign districts you have to give it some thought since favouring a character over another will end up in mutiny. I chose to balance out things so that I could play all of the loyalty missions. But if ignore to do so you will be getting different endings. The final main mission also gives you options for multiple endings. So it does seem that Mafia III has tried hard to make the game replayable at least story wise. The main missions and the story is a huge improvement on it's predecessor. First off the main character is a black Vietnam veteran (Lincoln Clay) who gets betrayed and is out for revenge. Apart from being exceptionally skilled he is also intelligent and persuasive. He manages to build bridges between natural enemies. The racial element is done well and I thought far more convincing than the way it was handled in Bioshock Infinite. Apart from the usual insults you would also get confronted with some more subtle examples you might not have been aware of otherwise. It was very refreshing to see a story from this angle and how black criminal organizations operate. But the story also features the main character of Mafia II and manages to give you better closure to his story than previously. I like how his story was intertwined with that of Clay and at the same time still felt like it's own game instead of a continuation. The main story missions unfortunately are also a little repetitive as you are required to accomplish certain tasks for each main mission. The idea is to cause enough damage to attract the attention of the boss of the district you are targeting. Again I wished they had given us more variety mission wise. It can be very daunting to do the same missions again and again. However I remedied this by taking my time and only played the game when I was in the mood for it. This way I prevented myself from getting bored or frustrated. A lot of reviews had experienced bad visuals and many other bugs. But apart from a few minor ones the game did not give me any issues. Naturally this is because most of the early bugs have been patched, I got this game new on sale for only 6 euro's and for that money I got a very pleasant gaming experience. This game is superior to Mafia II and is an example of how it is possible to do more with story based open world games. I do think it's a shame you aren't given the option to gather all the collectables after ending the main story. Then again there are too many of those and I don't have the patience to collect them all so it's not that big of a deal. In my opinion this game is a little underrated as it does show promise for future games in the franchise. Provided there are plans to make more games.